A new film set for release this fall drew together University of New Brunswick professors, staff, alumni and students in a unique adaptation of a short story from a book that recently captured the top award at the East Coast Literary Awards. “This was an epic film shoot. It must have been the toughest film shoot we’ve ever been on, in terms of what we trying to do with it,” says Dr. Robert Gray, a UNB English professor and producer on the short film drawn from his book, Entropic. In June, the book was selected for the Thomas Raddall Atlantic Fiction Award, valued at $25,000. The Beautifully Drowned, written and directed by UNB English department graduate Jon Dewar, was shot in just two weeks, dominated by 12-hour filming days across different locations in New Brunswick. One weekend was spent at Kings Landing Historical Settlement near Fredericton, while the next was in St. Martins with actors shooting scenes in the frigid waters of the Bay of Fundy. There were 50-plus crew on set at times – with 19 connected to UNB, including IT staff members, professors of English and psychology, media arts and cultures students, graduates from English, education and business administration programs as well as Renaissance College. 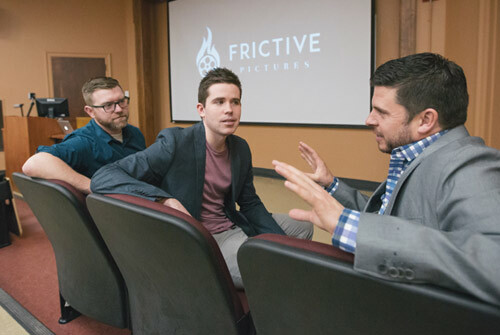 “This project provided invaluable opportunities for UNB film students and the New Brunswick film and theatre communities to come together, learn from each other, and bring something unique and ambitious into existence,” says Matthew Rogers, a PhD graduate from UNB’s faculty of education, who now teaches education at Acadia University. Dr. Rogers is one of the producers of the film. Set in a gothic fishing village, this revenge tale is a twist on the old story of wives waiting for husbands to return from sea. In this take, the wife wishes for her husband to wash up on shore dead. Mr. Dewar appreciates the partnership with Dr. Rogers and Dr. Gray, his former film professor. Indeed, the three of them have joined forces to create Frictive Pictures, a production company, and each take turns directing films every few months while the other two produce. Dr. Gray says it’s all about making sure that they are there for one another. “I think that came out of a mutual respect for each other’s stories, but also how serious we all are about constantly improving and striving to be the best filmmakers we can be,” Dr. Gray says. The trio’s films have played at film festivals internationally. Mr. Dewar’s previous film, Hypothermia, was featured in 17 festivals across North America, winning several awards. He attributes his success in filmmaking to his time at UNB and the connections he formed at the university. The Beautifully Drowned will be released this fall with the hopes of once again attracting international attention at film festivals.